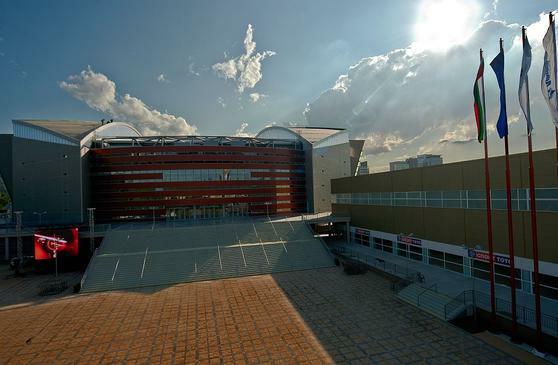 Multifunctional sports hall Arena Armeec Sofia Year of completion – 2011. The main function of MSH Arena Armeec Sofia is to provide Bulgarian athletes the best conditions for performing sport activities. The design of the hall reponds to all regulations of the international federations and their rules for organizing and running World and European Championships as well as high level commercial tournaments. More than 25 types of sport can be practiced at the MSH Arena Armeec Sofia: Aerobics Basketball Boxing Wrestling Badminton Weight Lifting Volleyball Karate-do Karate-Kyokushin Bodybuilding and Fitness Arm wrestling Artistic gymnastics Rhytmic gymnastics Handball Judo Trampoline gymnastics Acrobatic gymnastics Shooting Sambo Sumo Dance Sport Archery Table Tennis Tennis Fencing Chess Non-sport Events in MSH Arena Armeec Sofia The hall offers plenty of opportunities for promoting wide variety of cultural events. In case of promoting concert events the telescopic stands can be entirely or partially folded. Additional chairs can be situated on the arena, as well as stands. Scene or podium can be built in every zone of the arena. When promoting big events the hall capacity can be extended up to 17 906 seats (with stands). The adjacent hall spaces can be used for revues, exhibitions etc.